Wildlife Officer Joel Campora and Sheriff Cody Carpenter, of the Scott County Sheriff's Office, drowned while assisting victims of an overnight flash flood along the Fourche Lefave River near Y City, Arkansas. They had responded by boat to a 911 call at a home in the flooded area along the river. They both exited the boat and entered the home to assist two female victims who were trapped inside. At some point the officers, victims, and boat were swept away by the rising water. 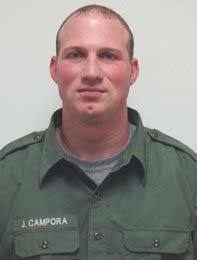 Sheriff Carpenter's body was located the following morning while Officer Campora's body was recovered three days later one mile downstream.